Get your chance to meet Jack & Jack and more - GA Meet and Greets Still Available! Did you miss your chance to grab a VIP ticket? Well, your general admission ticket gets you a chance to attend limited meet and greets with Jack & Jack Lohanthony, JennXPenn, Ricky Dillon, JC Caylen, Christian Collins, Crawford Collins and Dylan Dauzat. First come; first serve - limited signing passes will be available, so get there early! 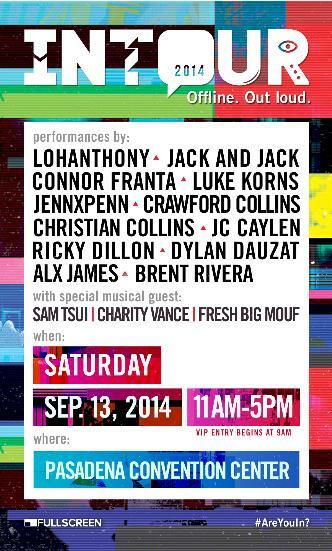 Welcome to INTOUR, the interactive social festival featuring your favorite stars! Parents: We know these days can be tiring, but we're here to help! We'll give you a free ticket so you can enjoy the experience with your loved ones. When you need a break, head on over to our lounge for parents and guardians. Relax and unwind in a quiet area with adult-only drinks available for purchase. *Must be 26 or older and attend with a paid ticket holder to be eligible for free entry. Parents can go in and out of the venue to relax and enjoy nearby shopping. GENERAL ADMISSION: 11:00am - 5:00pm. Start the day with an exclusive INTOUR wristband that serves as your ticket to the festival. See your favorite acts perform awesome skits, brand new songs, and more. Your general admission ticket gets you a chance to attend limited meet and greets with Lohanthony, JennXPenn, Ricky Dillon, JC Caylen, Christian Collins, Crawford Collins and Dylan Dauzat. First come; first serve - limited signing passes will be available, so get there early! VIP (SOLD OUT!!! ): 9:00am - 5:00pm. Here’s your chance to meet your favorite stars before watching them put on an incredible show. To make things run more smoothly, we’ve divided everyone into two rooms. Select one group to meet everyone in that room first - once you’ve gotten all of your photos, head over to the second room to meet everyone else! INTOUR AFTER PARTY (SOLD OUT!!! ): 9:00am - 7:30pm. After an action packed day of performances, take the time to hang with your favorite stars and help them celebrate their hard work with an exclusive after party. Enjoy free food and drinks while getting to know your favorite stars with a small group of their biggest fans. You’ll also walk away with a limited edition INTOUR t-shirt to remember the night. INTOUR is the ultimate interactive social experience featuring top digital stars. It grants the biggest fans greater access to their favorite digital stars. Beyond a simple meet and greet and a few minutes on stage, INTOUR is the premier festival experience featuring live performances, social media interaction, music, games, and more from Fullscreen talent. 2. Why is INTOUR only in Los Angeles? INTOUR debuts in Los Angeles in September as one of Fullscreen’s many future event activations to come. Let us know what city you want INTOUR to visit by tweeting @theINTOUR! 3. What’s the venue like? INTOUR is being held at the Pasadena Convention Center. This space was made to accommodate large events, so no worries for all of you with a slight case of claustrophobia! All performances will be held in the main conference hall, and there will be special areas sectioned off for signings, merchandise, and other fun activities. 4. Can I go without an adult? That’s up to you and your legal guardian to decide! If they decide they would like to attend, we are offering up free entry for one parent or guardian over the age of 26. There will also be a special lounge area (with adult beverages) so they don’t have to follow you around the whole time! Parking is available on site. Entrances to the underground parking structure are located on Marengo Ave, Euclid Ave or Cordova St.
6. Do I need to bring some form of ID to receive my ticket? Please bring a print out of your email with your order number, or show us the email on your mobile phone to grab your ticket at will call. 7. What time can I start lining up? General Admission entry begins at 11:00am, but if you want to get there bright and early, please arrive no earlier than 7:00am. If you need to pick up your ticket from will call, you can pick up your ticket starting at 8:00am and start lining up at 7:00am. If you scored a VIP pass, your doors open at 9:00am (Green St. entrance), but you too can start lining up at 7:00am. 8. Can I leave and come back? 9. Can I bring food? No outside food or drink will be allowed past the ticketing area. However, you may bring a sealed bottle of water into the event with you. We want everyone to stay happy and hydrated. 10. Will there be food there? Of course! There will be a dedicated concession areas to fulfill all your wildest snack dreams. 11. Can I bring a camera, phone, camera-phone, or other filming equipment? Do YouTubers and Viners love cameras? The answer is yes. Please be sure to keep an eye on any expensive items you bring, and try to limit your devices to handhelds. We want to make sure you’re able to capture all your favorite moments while staying comfortable throughout the show. 12. How do I meet my favorite vloggers? You have a few chances to meet your favs, but the only way to ensure that you’ll actually get a magical selfie moment is by purchasing the VIP level or After Party level tickets. If you’ve already purchased General Admission tickets, you can catch a few members of the cast during limited meet and greet sessions throughout the day. The one off meet and greets are first come first serve. A full schedule will be released closer to the day of the show. 13. Will there be merch available for purchase? Duh. You will have access to an array of beautiful INTOUR gear. If you’re thinking about sporting a Connor Franta fanny pack, have no fear. Each member of the cast will be bringing along their own merch for sale, as well! Don’t worry, we’ve got you covered! The event is taking place inside the Pasadena Convention Center. 15. I am a reporter and am interested in covering INTOUR. Who should I contact? Please reach out to press@fullscreen.com for more information and press credentials. 16. When will my tickets ship? 17. Can I buy tickets the day of the event? Sure! The box office will open at 9am, but tickets are going fast and we can't guarantee there will be any available. Early bird catches the worm. Have a question we didn't answer? Get in touch by clicking here.